Flitch Green is a civil parish in the Uttlesford district of Essex.. It consists of a new housing development built just outside the ancient village of Little Dunmow. The Community Hall is a multi-function venue consisting of a large main hall, 2 medium sized rooms for meetings or gatherings, multi sports court together with kitchen and sports changing facilities. The hall is run by the local community who identified a problem with the main hall. The problem being that the space was highly reverberant making it unusable for many purposes and was generally an uncomfortable environment. 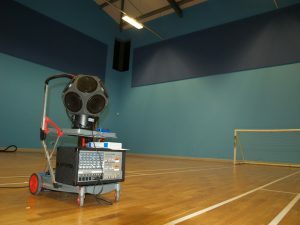 B L Acoustics were appointed to initially carry out acoustic tests and measurements of the area followed by a proposal to improve the acoustic performance of the hall. On initial observation of the site it was estimated that the RT would be well over 6 seconds and sure enough the measurements that followed indicated an RT60 of 6.8 seconds. RT60 is a method of measuring the reverberation time within a room by measuring the time it takes for sound energy to dissipate to a level that is 60dB lower than its initial level. Typically, large halls have long reverberation times because all the floor and wall surfaces have hard reflective properties and fail to absorb any of the sound energy. As such, we proposed to install a number of acoustic panels that would absorb this excess energy. Using simple Sabine calculations we predicted that the RT could be reduced to approximately 2.5 seconds by installing absorption panels at high level. There would be a total of 52 panels (13 on each wall), each measuring 2.4m x 1.2m creating 150m2 of absorbent material. 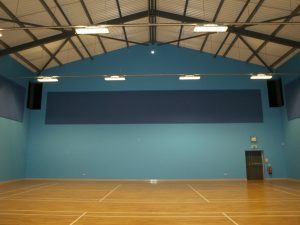 As the hall is often used for sports such as 5-a-side football the panels were a high impact variant, suitable for sports hall applications. Also, the panels were coloured to complement the existing decor within the hall. The panels were installed at a height of 6 metres which in itself provided some difficulties. An access tower was not a practical solution and the floor itself was installed with under-floor heating meaning it was weight sensitive. This required careful planning and considerate use of access equipment. The installation was carried out by BLA, on-time and within budget. Once the installation was complete a further RT test was carried out. Even prior to testing it was obvious that the performance had improved as the hall presented a much more comfortable environment. 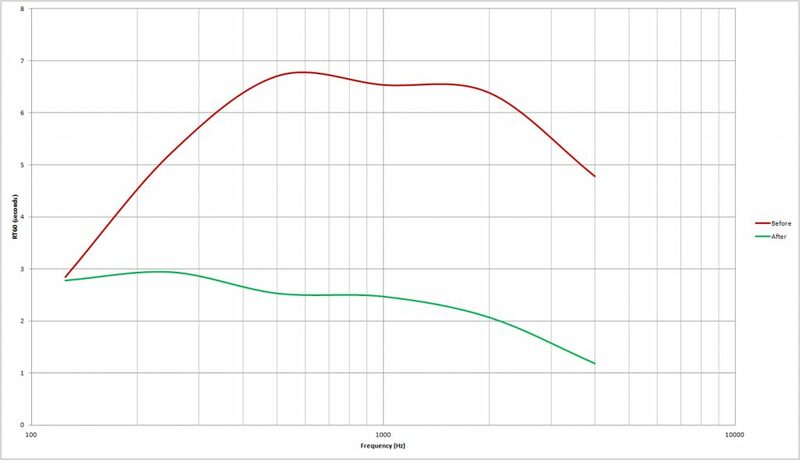 The test measured an RT60 of 2.3 seconds which demonstrates a dramatic improvement.